And here I thought Tetris was already random enough! Thanks for sharing! 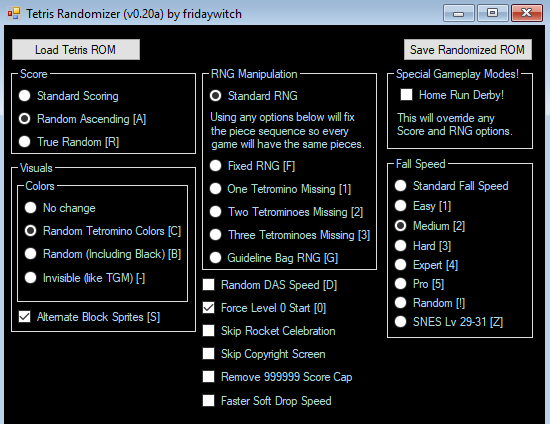 By the way, I discovered that gyre_ is currently working on a Final Fantasy randomizer bingo, but it has not been made public yet. Thanks a lot for the kind words Celice! And yes, I will keep everyone updated by posting about new randomizers. I will also continue to check this thread for submissions and suggestions just like before. The support from the RHDN community has been amazing, and I would need a very good reason to stop making this thread my primary update notification channel, but if I ever do I will try to make it as smooth of a transition as possible for everyone. Would it be alright to add https://www.romhacking.net/forum/index.php?topic=25918.0 to the list? There's already a Metroid 1 randomizer on there but it's for items and elevators. I made one that procedurally generates an entirely new map layout. Wow, I'll definitively add it for the next update! Thank you very much for sharing Hex4F and keep up the good work!